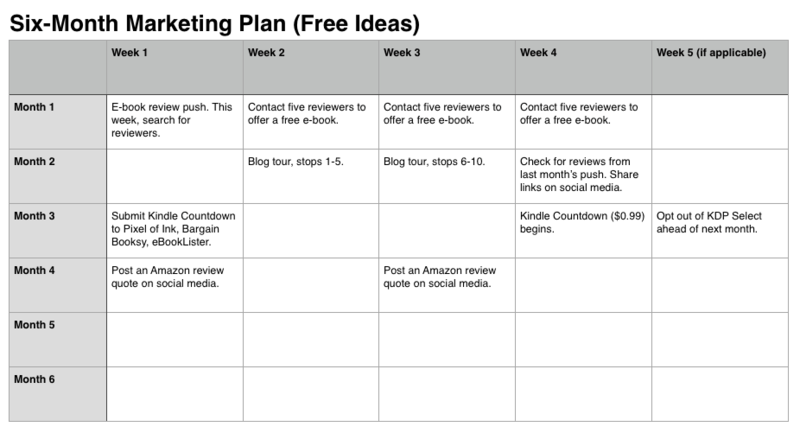 To wrap up this series on marketing budgets and promoting your book, I’d like to take a look at planning. I’ve explained why you should have a budget, and I’ve given you fifteen ways to promote your book for free or very cheap. Now it’s time to plan and schedule your campaigns (kinda like an army general). Let’s start with the why, then get into how to make your plan. Your goal is to keep a steady trickle of promotions going. Read it again. If you get nothing else out of this post, get that. It’s crucial to your success. When promoting your book, slow and steady is better than all at once. Think about a big grandfather clock with its steadily swinging pendulum: Tick (free for a week this month! ), tick (advertise on a new website! ), tick (interview on a podcast!). Measured pace, slow and steady. But over time, it builds up. A steady march forward is better than cramming all the promotions into a single month. For one thing, you won’t be spending more than you budgeted. For another, your book will constantly be in the public eye, instead of lighting up the sky for a few moments like the Fourth of July finale. Making a plan is the key to keeping yourself from piling on the promotions in a moment of excitement. If you can channel your excitement-fueled energy into creating a plan, you can get through the not-so-exciting moments by simply working the plan you’ve already laid out. 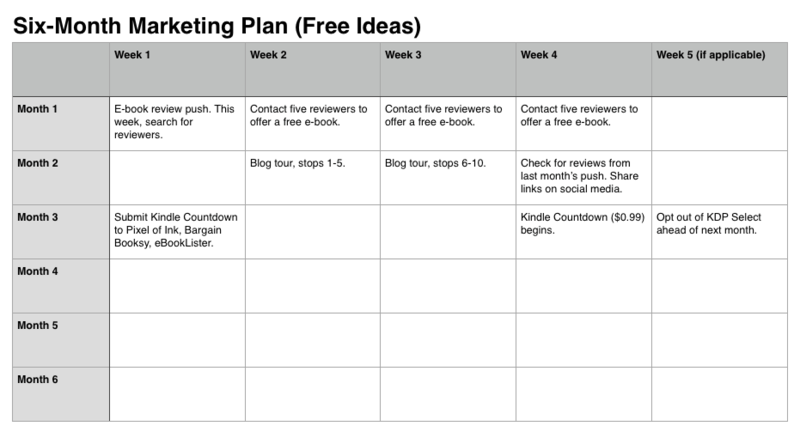 So let’s talk about creating a marketing plan! 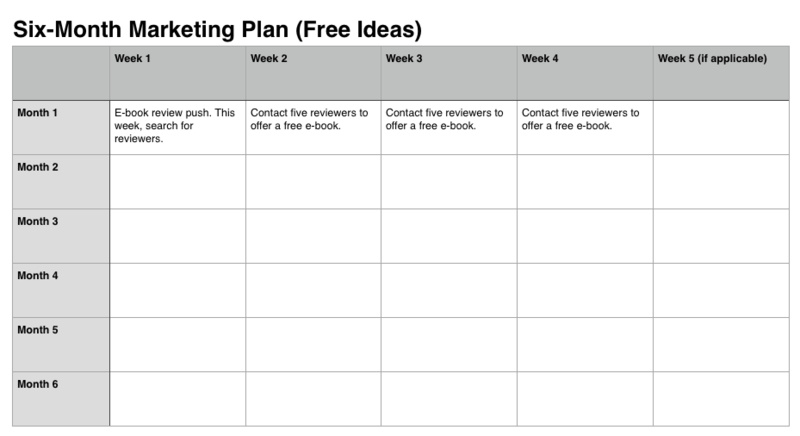 First of all, grab this free schedule template I’ve created for you. It gives you twelve months of promotional planning space. I’ll walk you through filling in this chart with a six-month version. Let’s start by looking over the blank chart. What we have is each month, divided into weeks. 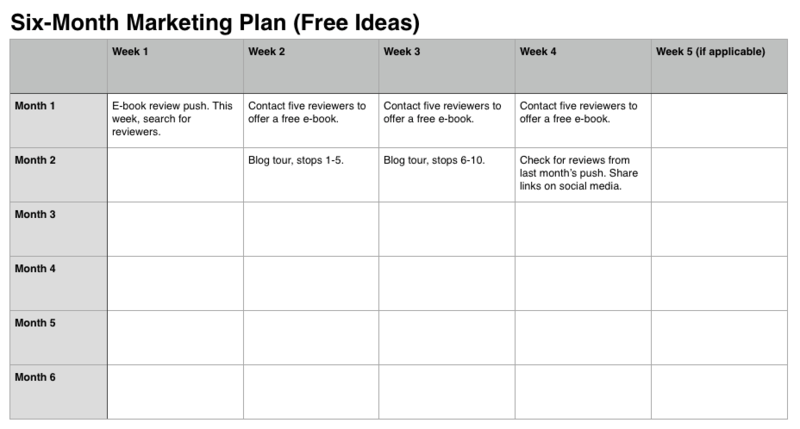 This is because longer promotions do better than spasmodic day-to-day ones, so this template is designed to remind you that most promotions should last at least a week. As an added bonus, giving yourself a week to do the smaller tasks can make it a little less daunting. I’ve given you five weeks for each month, realizing that, of course, some months don’t have five weeks. Use that fifth week as needed. Or use it for notes. Let’s start by making some rules. We’ll say that for this example, I’m strapped for cash and don’t want to spend anything for the next six months. We’ll also say that my goal is to create a pretty heavy promotional plan, hoping to boost my sales so I can afford to spend money on promotions further down the road. I’d like to do a Kindle Countdown promotion, but I know that a lot of the deal sites only feature books with ten or more reviews. Let’s say my book only has seven reviews. For my first month of promotions, then, I’ll concentrate on getting at least three more reviews. I’ll make a goal of contacting fifteen new reviewers. The first week, I’ll just make a list of prospects. Then for the next three weeks, I’ll send offers of a free e-book review copy to five people. That looks great. I know it’s going to take those reviewers a little while to read my book, so I’ll plan another month before my sale. Maybe I can build a little buzz with a blog tour. I’d like to have ten stops on the tour, five per week. At the end of the month, I’ll check for new reviews from last month’s campaign and use my social media accounts to share any that have gone up. There, that should give me plenty of time to get those three reviews I’ll need to make a Kindle Countdown deal successful. I’ll add it to my schedule. I’d also like to try promoting on some other stores, so once the Countdown deal is over, I’ll opt out of KDP Select. Whew! All of that promotion makes me tired just thinking about it! Let’s make the fourth month lighter for a break. I’ll just plan to post review quotes on my social media platforms on two of the weeks. Now I need to get right back into things for the fifth month so I don’t lose my momentum. I’ll plan to offer my book for free on NoiseTrade for this month. Hopefully, I’ll get some new e-mail addresses for my mailing list ahead of the next month’s promotion. And speaking of next month, I think I’ll see if I can get my author friends together to put on a big half-off sale. I’d better contact them in month five to coordinate for month six. One month to go! I already decided to do a half-off sale with other authors, so let’s fill that in. I’ll plan it for the end of the month to leave plenty of time to organize it. I need to get back into the KDP Select program for some Countdown deal days. And it wouldn’t hurt to submit my book’s sale pricing to all the deal sites again. There we have it. 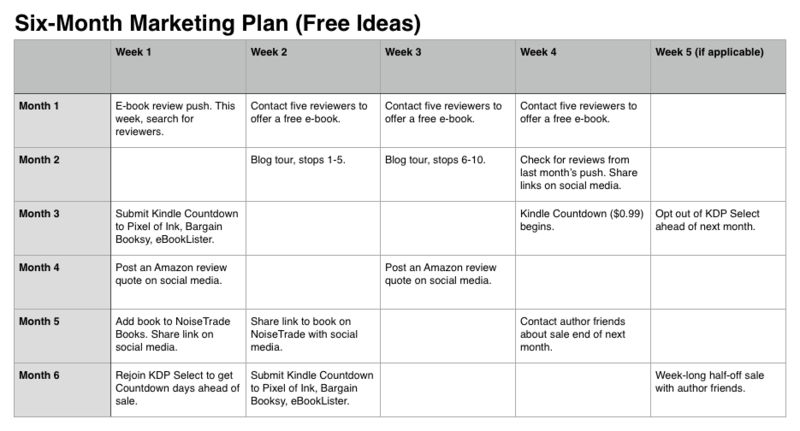 I’ve created a six-month plan for marketing my book that won’t cost me a dime. Now I just have to work my plan! You can download this schedule if you like. Feel free to use it to promote your book. Modify as desired to create your custom plan! 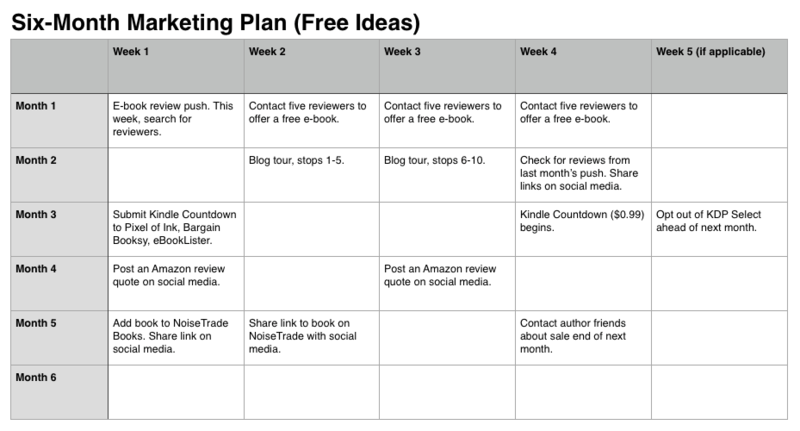 Grab this great free self-published book promotion plan! Now you can use the same steps to create a plan of your own. Remember to keep that grandfather clock in mind as you promote your book steadily and surely to success. Fix My Story mailing list subscribers, check your bonus page for five more sample schedules! Click to get your bonus content for this article.